How do you scroll the challenge description? 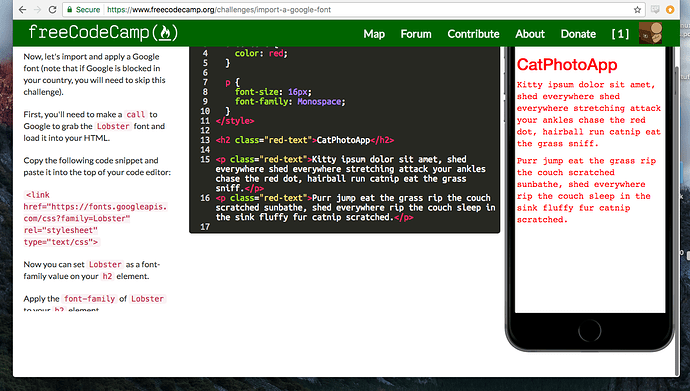 I just signed up and started the HTML path today. 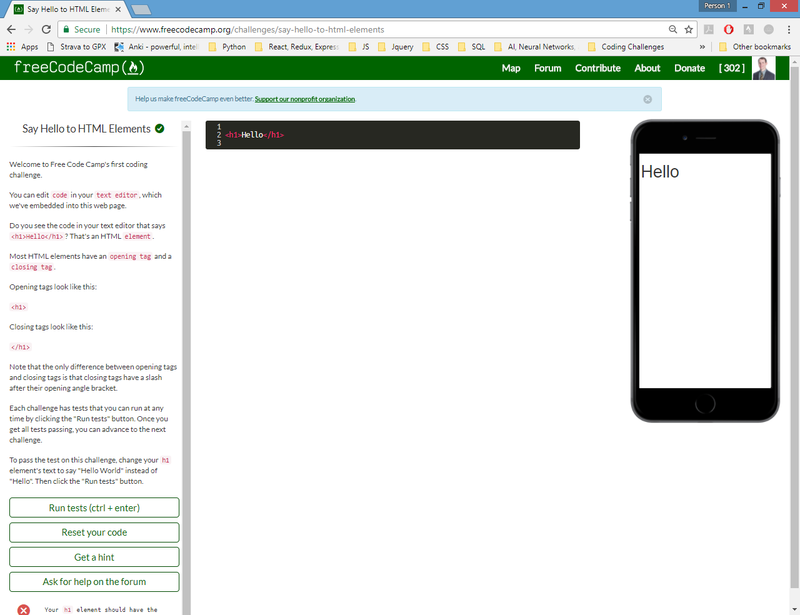 The second lesson, Say Hello to HTML Elements, seems to not be a full page. The description to the left cuts off mid sentence and there is no button to continue. The lesson after that seems to be the same, the image does not load all the way, even the scroll bar does not scroll longer than what initially loads on the screen. Is there a way to actually contact the FreeCodeCamp creators and the actual technical support for the website? Would you mind sharing a screenshot of what you are seeing? Maybe we can make some suggestions based on what we see. When I am using my pc, I see this on the lesson to which you are referring. Sometimes, just refreshing the page can clear up issues. If you are on a Windows machine, there is a keyboard button called “prt sc”. Press that and then do Ctrl+v to paste into your reply. What operating system and browser (include version) are you using? This is on Chrome, sorry didn’t see that part of the question. Very interesting. Hopefully, some others will reply who might have seen behavior like this before. I personally have not seen anything like this. So I went on to the paragraph section and that appeared a normal page. It looks like just the second and third lesson are the ones not showing properly. I have learned a little before using this so i don’t need the into to the elements, but I know that someone just starting out is going to get very frustrated! Just Kidding, skipped ahead to the “Import a Google Font” and it is doing the same thing! If you put your mouse between the first and second sections, does a scroll bar appear and let you scroll down? If not, can you click into the first section and use the down arrow key to scroll down into the section? Not sure if you are zoomed in, but try pressing ⌘ and - on your keyboard at the same time to zoom out and see that allows you to see more content. 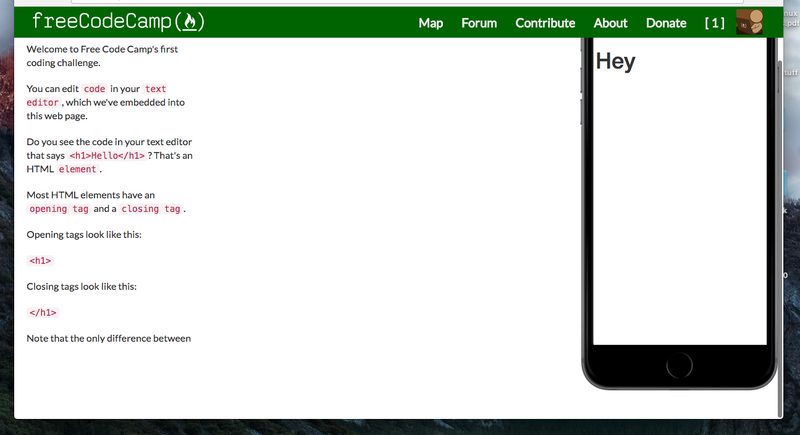 Well I have to say that is the dumbest design for a website that I have ever seen! I would have never thought to put my mouse on the words, which are not clearly defined as a section at all, and scroll down. The most unintuitive thing ever! And on a website made for people who are just learning! Does anyone know who I can contact about the really not user friendly design? or am I the only person who didn’t get that?! At this point, I am not sure if it is a website design issue or a browser configuration issue. I have been on FCC since January and this is the first I have heard of this kind of problem. As you saw from my screenshot (I am using Chrome on Windows) the grey vertical scroll bar shows between the instructions section and the code section. Give it a a few hours, because I am sure you will get some more responses. I will ask around also. Thanks for your feedback. We have experimented with different scrollbar approaches in the past, and it’s hard to get them to look good on all operating systems and browsers. We will continue to improve this aspect of our usability, though. This is very helpful. Also, thanks @RandellDawson for your patient help with this! I am on Mac OS Sierra + Google Chrome and everything is working fine for me. I never faced such issue.